The Chesil Bank and the Fleet Nature Reserve is an informal reserve managed by the Warden who is appointed by the Ilchester Estates. The management office is located at the Chesil Visitors Centre. The Warden’s work is guided by the Fleet and Chesil Bank Management Plan. The area covered by this plan extends from the Ilchester Estates western boundary 2 km west of the Abbotsbury Beach car park to the Chesil Visitors Centre and car park at Ferrybridge. Between these limits the landward boundary is the top of the low cliffs along the Fleet foreshore and the seaward boundary is the Lyme Bay shoreline of Chesil Beach. Outside of this declared area the ethos of the reserve is applied voluntarily across other parts of Chesil Beach in collaboration with the various landowners. The Chesil Bank and the Fleet Nature Reserve operates with funding from the Fleet and Swannery Trust (FAST)and other funding organisations. The Reserve works in partnership with Natural England and other national organisations, local authorities and local communities to fulfil its aims and objectives. Annual meetings with representatives of the above-mentioned organisations have been held since 1978. This meeting also has served as the Chesil and Fleet Advisory Group of the Chesil and Fleet European Marine Site (EMS) Management Scheme introduced in March 2001. The EMS management scheme has resulted in an additional 2-3 steering / advisory/technical meetings working to tackle issues identified in its action plan. Such actions are undertaken by the relevant authorities (Natural England, Environment Agency, Portland Harbour Authority Ltd), and the local authorities) in support of the Ilchester Estates’ site management and the Advisory Group. 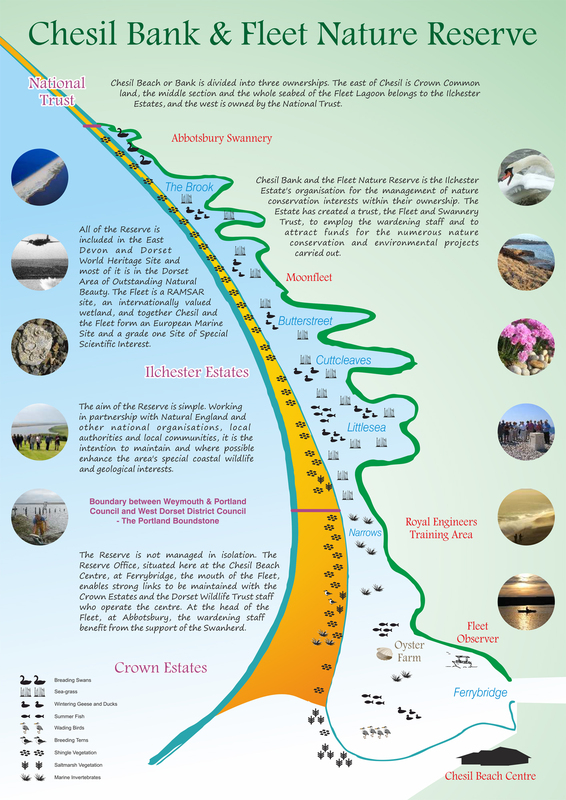 The Chesil and Fleet SSSI is divided into units which are scientifically assessed for their condition by Natural England approximately every six years. As ‘primary habitat’ nothing has to be managed – the beach and the lagoon are left to evolve according to the forces of nature. Practical work is limited to managing access and recreational activities through patrolling, erecting signs etc., and looking for signs of any potentially damaging concerns from external threats. Emphasis is put on preventative management to ensure that visitors and the local community are aware of the nature conservation sensitivities. The Reserve’s Office at the Chesil Beach Centre enables a management presence to be maintained at Ferrybridge, the mouth of the Fleet, with the Crown Estates and the Dorset Wildlife Trust staff who operate the centre. At the head of the Fleet, at Abbotsbury, the wardening staff benefit from the support of the Swanherd.